This post has nothing to do with food—or even running—but I’m hoping to get your help to spread the word so we can find the owners of this little dog. I was at home at about 11 a.m. on July 1, when I noticed a small dog running back and forth on the street outside my house. He was covered in poop and looked obviously lost. After two baths to get him clean, he spent several hours pressed in the corner of my kitchen while I worked. Eventually he made it to the couch, where I wrapped him in a wool sweater—and he slept for the next 36 hours with only short breaks for food and water. 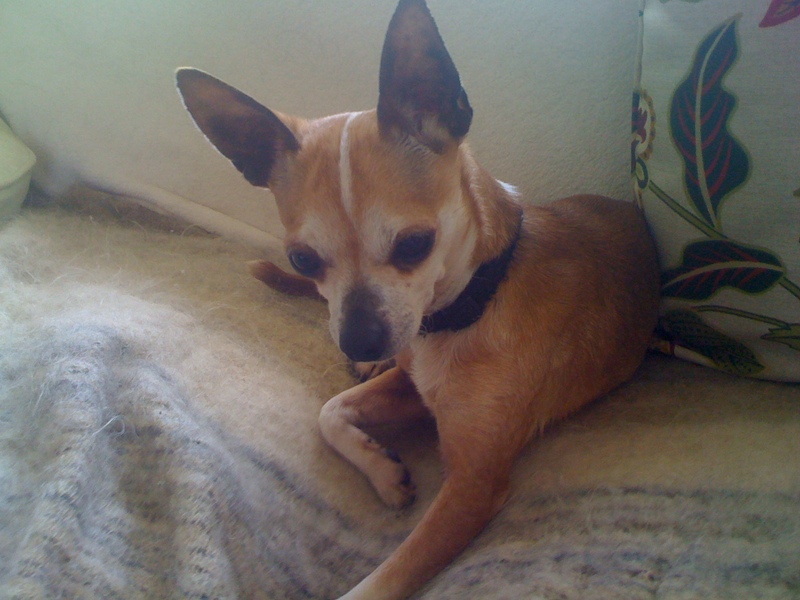 I posted something on the Beacon Hill Blog and contacted the local animal shelter, but so far no one has reported a lost chihuahua. I also took him to our veterinarian to see if maybe he had been chipped, but unfortunately he wasn’t. My husband calls him Nugget, because he’s little and gold, but we can’t keep him. Our chocolate lab mix, Hudson, is OK with the little guy, but our German shorthair princess, Ruby, is not happy to share her sofa, or bed, with a chihuahua. We assume Nugget has owners who would like him back, and we’d love to return him to his loving home. Please share this with anyone who might be able to help us get him home.